I am so psyched about moving. There are so many things I am setting in motion for when I move which will make me more environmentally friendly. Some I could do here, but most I can’t. In case you don’t know I live in a 1 bedroom flat under someone else’s house. The street it’s on is favoured by those who love to speed, making it a little scary to do much outside, as my 3yr old and 1 yr old like to run off. I don’t have a backyard or anything. How sad. I am excited over a clothesline and mine isn’t even this good. Mine is slightly bent and doesn’t go up or down. 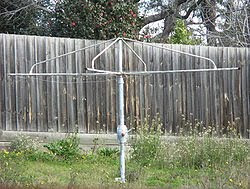 BUT it does dry washing and is in a fenced off backyard, so my kids can’t run onto the road. What is that? It’s a solar cooker. You can get much fancier ones, but this is a basic DIY type one. 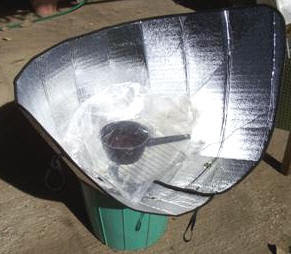 It cooks food slowly using the sun. Since I love my slow cooker I will be able to make food we like in the same manner but with no electricity. I’ll also be making its cousin, the sun dehydrator. I use my electric one, but to be able to do it naturally would be awesome! I’ll be getting or making a compost bin/section of my garden. I haven’t decided which I am going with yet, but I’ll be researching it. I’ll be getting chickens too. I’ll have my own free range eggs. Fresh eggs are so much healthier, tastier, and nutritious and filling compared to their supermarket version. I’ll have also been reworking how I was going to set up our house. I have decided to put my daughters in a different bedroom. They like a nightlight, this only started a few months ago and we are trying to get them out of it. If we can’t change their habit by the time we move they will be going in the front bedroom. It has a street light outside, which would be great as a night light. I used to open the curtain a crack when I was breast feeding my eldest and it was fantastic. Since it is already on, why not use that instead of having our own electricity on. Another alternative is solar lights. Leave them out in the day and bring them in during the night. I only remembered this tip 2 days ago; otherwise I would’ve implemented it when my girls first wanted a light. So far we have had 2 light free nights, so fingers crossed we won’t need them. And lastly I will be growing more fruit and vegetables. 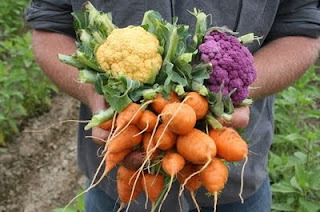 I have a few herbs in pots, but would love a proper vegetable garden and a few fruit trees. I know it will take quite a while before I reap the rewards, but the sooner I start the sooner I see the benefits. There so much more I will be able to do and it is very exciting, but these are the changes I will be able to make in the first few weeks of moving. Hi there! I am your newest follower. Found you on Green Blog Hop!! Great blog!! We have a small garden that we share with the neighbors, but I still supplied the neighborhood with cherry tomatoes all spring.